SBID members are varied, with many different interests and skills, different requirements and aspirations – and yet collectively, if we tried to define what an SBID member looked like I could only say they have one undeniable common goal, and that is a yearning for excellence. The aim of an organisation is to bring together a group of individuals with a common goal; to improve and share knowledge, to help their peers, lobby for change for improvement and to recognise and acknowledge excellence. In creating a unified organisation and setting standards accepted unilaterally by the European Council, Britain through SBID has finally been accepted for the first time in the council’s twenty year history as a member. Now we have a benchmark. 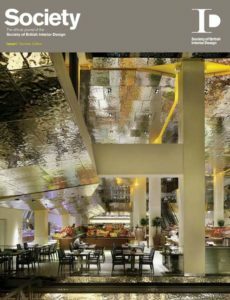 Our cover image from Lifschutz Davidson Sandilands’ Tsvetnoy Central Market project in Moscow was last year’s winner of the Best Interior Design in the SBID International Design Awards 2011, turn to page 42 to see more of the winning projects. Image credit ©Chris Gascoigne.